NB this page is about how to physically locate our building. For contact details, please see our contact page. 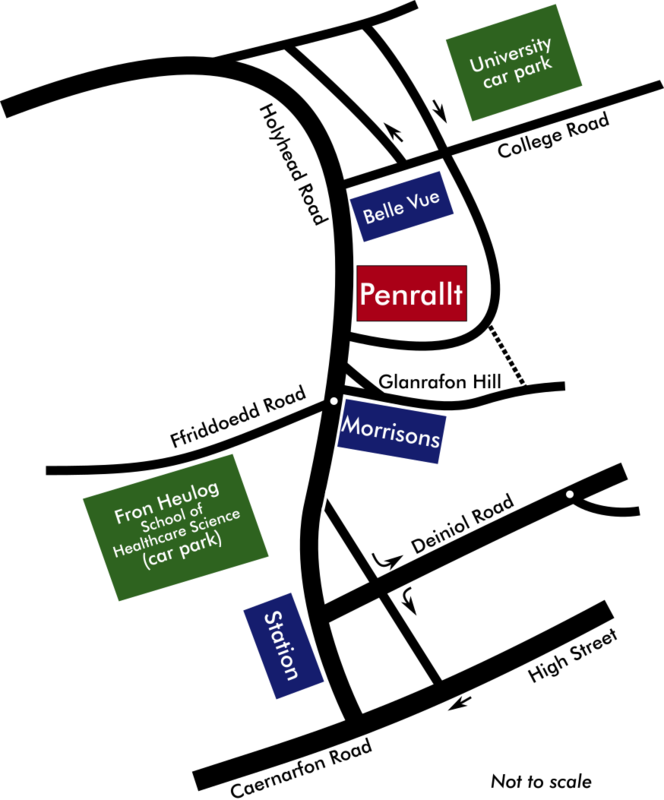 We are located in Upper Bangor on Holyhead Road, between the Morrisons roundabout and College Road. The building is on the right-hand side as you head up the hill, or on the left as you go down. We are about two doors down from the Belle Vue pub, which stands on the corner of College Road. Click on the sketch map to see it bigger (use your browser's back button to return to this page afterwards). There is also a Google map at the bottom of this page, with more detail and the option of a satellite picture. If you are travelling to Penrallt by road from any direction and are not familiar with Bangor we recommend coming via the A55 and turning off at Junction 9 (the one just before the Britannia Bridge - or just after it if you've come from Anglesey; this is the third turn-off for Bangor if you are coming from the East), then following signs to Bangor (A487, joining the A5 by the Antelope pub). As you come into Bangor, the road sweeps round to the right just after the 30mph speed limit sign. Shortly after this, look out for a pedestrian crossing followed by a turn-off to the left, with the Belle Vue pub on the corner. Our building is just past the pub on the left (on the main road). Our postcode, should you need it for your Sat Nav or other direction-finding tools, is LL57 2EU. If you would like further assistance with directions, please contact the church office. Please note that we do not have any spaces in the car park next to the church, which is pay-and-display (£1/hour). Bangor train station is about 5 minutes' walk away down the hill and there are fairly frequent train services in both directions (i.e. towards Holyhead and towards Llandudno and England). There are several bus stops nearby, used by number of local bus routes. Bus timetables are available to download from Gwynedd Council and you may also find the Traveline-Cymru website a useful resource for planning journeys by public transport.